It is fair to say that the ridge of a thatched roof is its crowning glory, particularly with a nicely proportioned ornamental block type ridge. Ridges come in several types; There are the butts up and the wrap-over types, whose names are almost self explanatory. the butts up type has the butts of the straw pushed together at the apex and the wrap-over type has the straw bent over the apex and fixed down on either side, akin to a ridge tile. Then there is the flush type where the bottom edge of the ridge is sheared flush with the main coat, giving a seamless appearance and the block type, where the bottom edge is raised by a few inches above the coat-work and is usually cut into an ornamental pattern. Each thatcher generally uses the same, unique pattern for his ridges and this is often considered to be a thatcher's signature. Within a localised area it is therefore easy to see the same thatcher's pattern on several roofs. Flush and block ridges will last equally long. 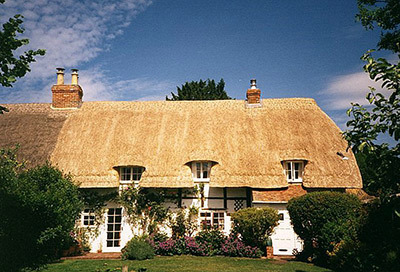 The simpler, flush type ridge is considered to be traditional and indeed, when thatched roofs were considered an inferior and outdated kind of roofing, why would anyone pay more (in both labour and material terms) for a decorative effect. Conservation officers are usually keen to promote the flush type ridge and a change of ridge from block to flush type is usually allowed.